I don't talk much about my job here, and it's not because I don't love what I do (I LOVE what I do), it's more that I don't really think it would be interesting to most of you. If you don't know what I do, I'm a marketing assistant for a content marketing agency. I know, right, it's marketing-ception. But what this basically means is that I work on the marketing team of a marketing agency. I market the marketing. I've just celebrated a year at Axonn and I've never felt so comfortable in a job. It's hard work and we're a small team but we do a LOT, from social media to email marketing to blog content to ebooks, drip campaigns, webinars, whitepapers and everything to do with the website. We're rarely bored, put it this way. 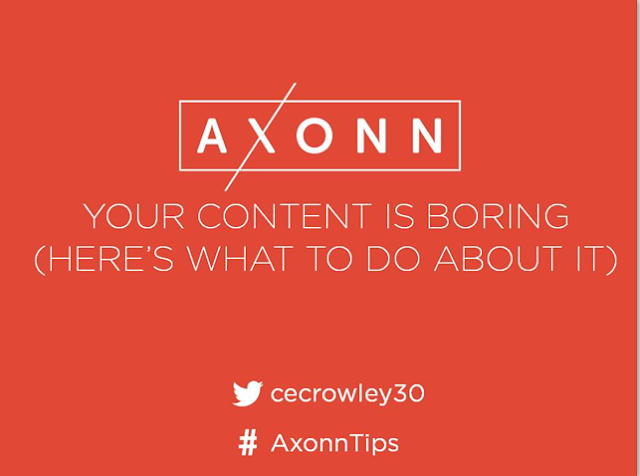 2) Blogging and content marketing are basically the same thing. The big focus on my blog is content writing and content editing. 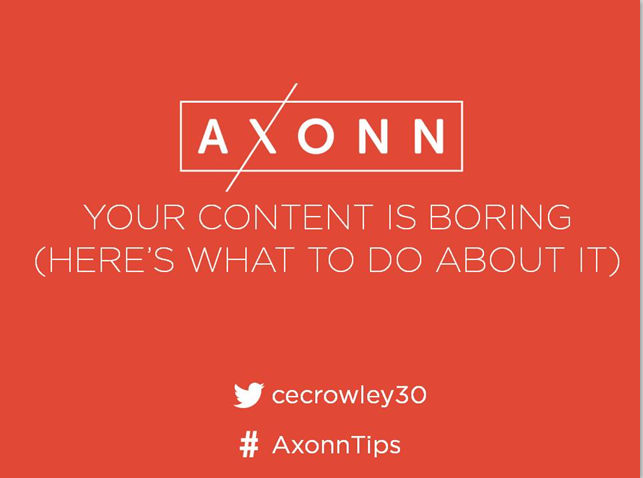 I'm in charge of all the content that goes on the Axonn blog (and for the most part, everything that goes on the website) so my job really is writing, curating, begging-people-to-write, editing and promoting content. And isn't that basically what blogging is? I mentioned in a post a few weeks ago that I was going to be presenting a webinar in authenticity and content marketing, and today was the day! It was part of a 4 hour bumper webinar that myself and several of my colleagues were involved in so I spent today live-tweeting like a boss and gearing myself up for my own talk! My talk was actually highly influenced by my blog and by blogging and focused on the need for stories, authentic content, vulnerability and sometimes, a bit of controversy in content. While I work in a B2B marketing environment, I actually think a great deal of my tips would be relevant to bloggers too! I pop up around the 2 hour 9 mark and my talk is about 20 minutes. Apologies for the stumbling at times - I was very nervous! I hope you find this interesting if you work in marketing, or would like to work in marketing! Feel free to give me a shout if you have any questions - my person Twitter is @gnd_fashion but as you can see from my presentation, I also have a work-related Twitter, @cecrowley30.